In an earlier article I described my antenna siting options. Three of those options (and two that I plan to use) require a small tower: one bracketed to the south side of the house (B) and one guyed in the yard (C). The missing piece in my expansive junk box was the tower itself. It seems that even buying a new tower is not the easiest of propositions. Finding local dealers and arranging transport are neither easy nor inexpensive, yet my requirements are modest. A tower of 30' or so suits my antenna objectives. Additional height would come from a mast to support the apex of wire antennas. The industry has changed in the 20 years I've been out of the hobby. There were 2 major domestic manufacturers of residential-grade antenna towers: Delhi and Trylon. While Delhi is no longer in existence, its tower business now belongs to Wade Communications. Trylon is still Trylon. Common US tower brands such as Rohn are not often seen in Canada since towers do not travel well. By this I mean that transport is expensive (due to size and weight) and not always easy to arrange, and domestic dealers are few. The Delhi towers are the DMX series that are ubiquitous in the backyards of Canadian hams and the lighter-duty Golden Nugget series that are typically used to support TV antennas. Both lines appear unchanged and are on offer from Wade. After a brief and fruitless search Wade pointed me to a local dealer. But then I went online to first look for used towers. Finding used TV towers was becoming difficult around 1990 since the migration to cable was largely complete. Except in rural areas there were few used TV towers for the taking. The market has since reversed course due to the resurgence of OTA (over-the-air) TV viewing by so-called "cord cutters". Used Golden Nugget towers are showing up everywhere. I now have a 30' Golden Nugget 18-gauge tower (actually about 28.5' when built) sitting on my deck, including a 10' length of 1.5"-OD mast. It was free for the taking, provided of course the purchaser took care of taking it down. So I dusted off (and tested!) my climbing gear and quickly relieved the homeowner of it. I left him the TV antenna and rotator so that he could sell it, and so come out ahead as well. 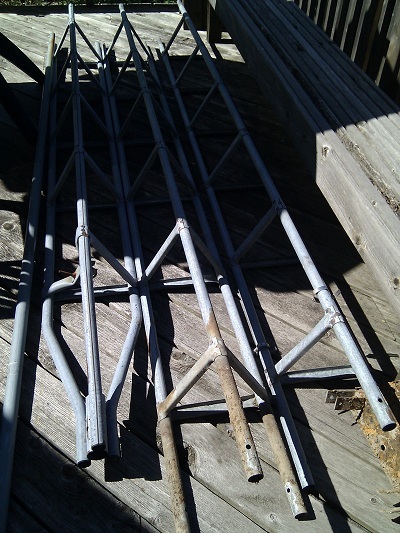 These towers are relatively easy to put up and take down if you have experience with the bigger, amateur-grade towers. I easily handled it on my own, with the homeowner as ground crew. I did make a sight on the drive across town with the tower dangling out the back of my sports car. You do get some surprises when you see how some of these TV towers are installed. It's a bit scary what passes for a residential tower installation. I'm sure the reason the majority of these towers don't come crashing down is because the bottom 2/3 is sheltered from the wind by the house it's bracketed onto. There are always going to be trade offs when you go the used route rather than buying new equipment. Towers are no different. A compromised tower is not one that should be repaired; it should be thrown out! Rust is common. Galvanizing is not a miracle cure, it only delays the inevitable. Cheaper tower uses the cheaper galvanizing process of electroplating rather than the better hot dipping. This tower appears to fit into the former category. Apart from cosmetic rust there is more serious deterioration at the bottom of the bottom section and the base plate since the previous owner buried the bottom with the intention of making the installation more sturdy. That is unnecessary when properly mounted. Burial greatly reduces the life of any tower, especially those with tubular legs since water will pool inside the leg. You can get an idea of the rust in the close-up view I've attached. Although the base plate looks quite bad it is in fact perfectly usable; most of the "scale" you can see is debris that can be cleaned off. The base metal is mostly intact though little of the zinc coating remains. The base plate is heavier gauge steel so that it can withstand ground contact for the life of the tower. Of more concern is the bottom of the tower. Golden Nugget is 12"-face, 18-gauge steel (I weighed a 10'-section a 12.1 kg, or 26.5 lb) and is vulnerable to weakening due to rust penetration. The tower also comes in 16-gauge steel, but you don't usually get to choose when you buy used. I doubt that most OTA users are aware of the difference and simply steer toward the lower-price option. On first inspection the tower bottom looks good enough for reuse. 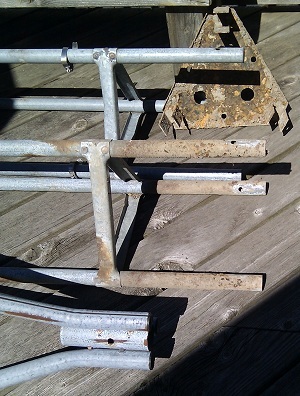 The rust scale will have to be removed and then painted over with a suitable product. Even so I am reluctant to use this tower at site B, bracketed to the house. It may be best suited at site C where it can support a fibreglass mast and wires for the low bands, in particular a delta loop for 40 meters. The other thing I've collected recently is stackable 4'-sections of 1.75"-OD surplus fibreglass mast from Maple Leaf Communications. The price was right and it looks as if it can do the job I require of it (without actual specs there is some risk which I will mitigate as well as I can). As I pointed out in the article on the nested 20-15-10 delta loop antenna, the mast must be non-conductive and would have to vertically span 7 meters. I bought enough of the fibreglass for both this antenna and for the top part of the supporting mast of the 40 meters loop. I'll have more later when I am ready to erect antennas. I still have a little more work to do to prepare the basement shack, work that is harder for me to get motivated to complete as the season grows warmer. For now I am QRT since I ran into the foreseeable problem of setting up in the guest bedroom: guests arrived. What can you suggest someone use to re-paint the tower? I use a paint intended to be applied directly to the rust. I use Tremclad but there are other products on the market. Just be sure to follow the instructions, in particular taking care to remove all the loose rust. Loose rust and dust will come off and take the paint with it. Redo areas if the paint doesn't hold.